How to perform a manual upgrade of the crowdbeamer firmware? 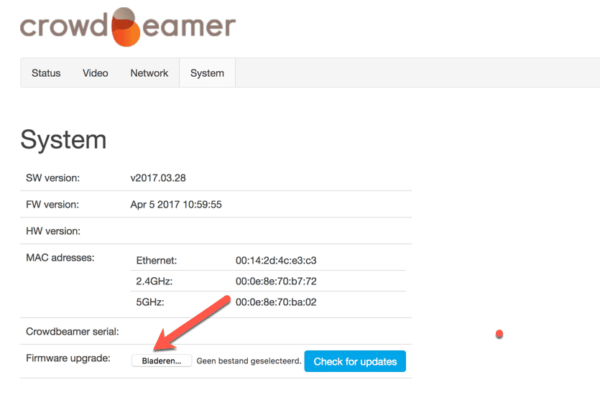 How to perform a manual upgrade of the crowdbeamer firmware? How to perform a manual upgrade of the crowdbeamer firmware? 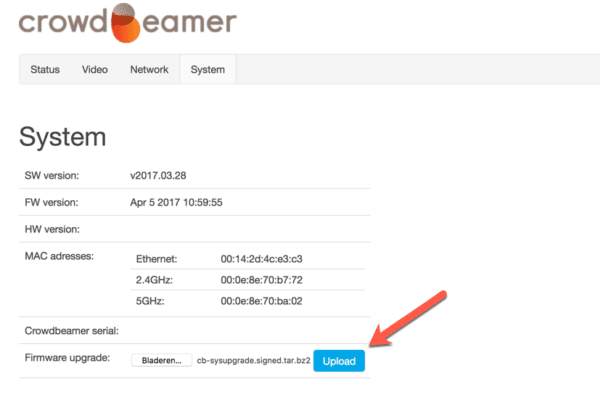 Go through the steps below to perform a manual upgrade of the crowdbeamer firmware. 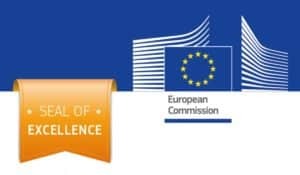 To perform a semi-automatic upgrade of the firmware, please check this knowledge base topic. 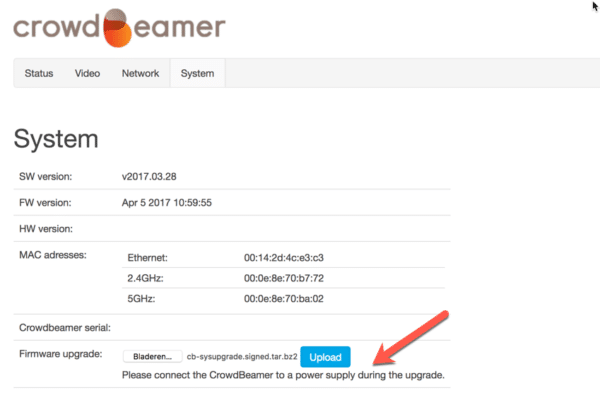 Before you start the firmware upgrade process, make sure the crowdbeamer battery is adequately charged or your crowdbeamer device is connected to the power grid. Download the latest firmware upgrade from www.crowdbeamer.tech. Connect your laptop to your crowdbeamer’s private 2.4GHz or 5GHz WiFi network. 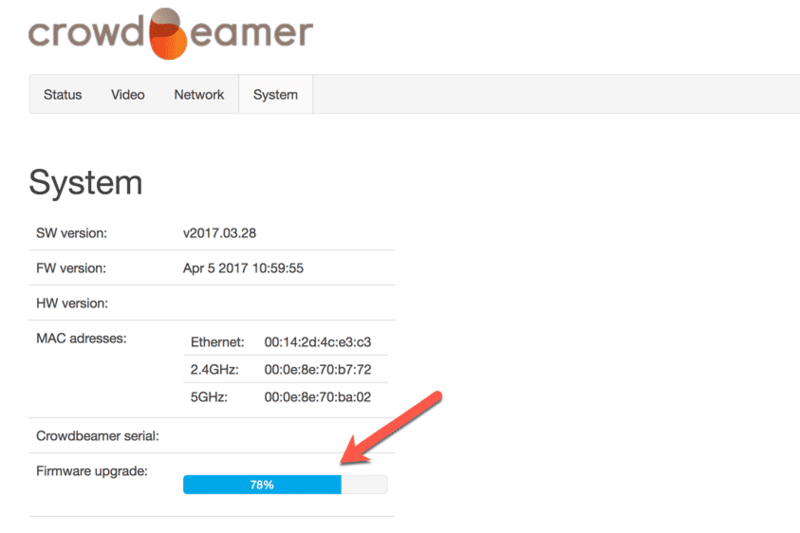 Open a new browser tab, go to http://192.168.0.1 and then select the “SYSTEM” tab. Upload the firmware upgrade file by selecting it from your laptop’s file system using the “Browse…” button. 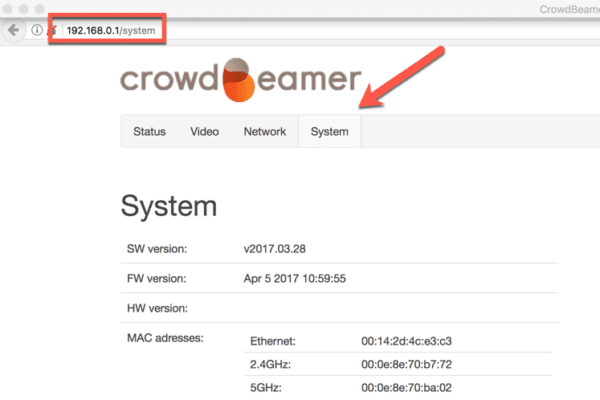 In case the battery of your crowdbeamer device is not adequately charged or it is not connected to the power grid, you will be notified. You will only be able to proceed with the firmware upgrade process in case these issues have been solved. 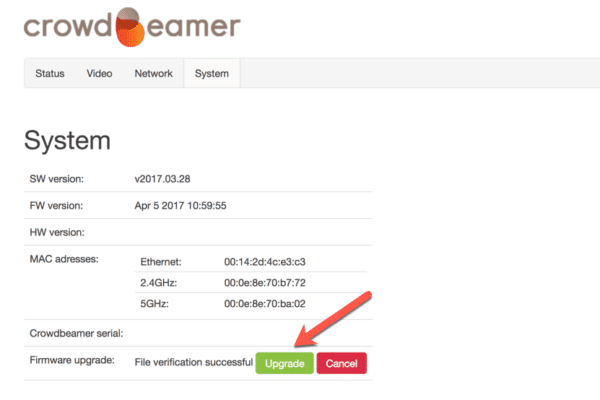 As soon as the file package has successfully been verified, you can launch the firmware upgrade by pressing the “Upgrade” button. Thanks for upgrading your crowdbeamer firmware.